And for DPRK’s President Kim Jong-un to recall – John Bolton, Trump’s National Security Advisor, said just a couple of days ago, referring to North Koreas denuclearization – “Libya should serve as a model”. You may remember in 2003 / 2004 Gaddafi was accused of hiding weapons of mass destruction (WMD), i.e. a nuclear arms development program. The west blackmailed him to get rid of it, against some ‘economic aid and favors’, of course. Gaddafi accepted. The western sicko leaders all became friends with him, the French then President Nicolas Sarkozy on top, who is now accused in French Courts of receiving up to € 50 million ‘illegal money’ (what is legal money by western standards?) from Muammar Gaddafi for Sarkozy’s 2007 campaign. Well, we also remember how in 2011 he was miserably tortured and slaughtered anyway, despite his concessions to the west on his alleged WMDs, by NATO forces led by France and viciously supported by Hillary Clinton, then Obama’s Secretary of State. Had Gaddafi kept his weapons, he may be still be alive and Libya and Libya’s people may still be prospering as they did before the US-NATO onslaught in 2011. For now, the US of A seems to go passively along with the Peace Initiative. It’s more, the Donald is actually claiming credit for it. It is unbelievable but true. There is even a group of Trump supporters who will propose Trump for the Nobel Peace Prize. Imagine! – But why not, after all, Obama got the prize before he really started his Presidency – and then he bombed more countries and killed more people than any other US President in recent history. Yes, all is possible. We are living in a world where war is peace, where you are made believe that bombing a country to rubble will bring peace. Seriously. And the western people, brainwashed to the core, believe it. However, despite Trump the “peacemaker”, be on your guard. Iran’s Foreign Minister, Bahram Qassemi, so pointedly said – never trust any agreement or promise made by Washington. He referred, of course, to the 5+1 (Permanent Security Council Members, plus Germany, and, of course, Iran) Nuclear Deal that Trump wants to abolish, or at best renegotiate – for which he engaged his new little boyfriend, Macron, to call Mr. Rouhani to please agree to re-discuss the Nuclear Deal and the issue of Iran’s long-range missiles. Of course, Mr. Rouhani turned him off. And, as I’m writing these lines, Netanyahu comes to the fore with the most flagrant of lies – but he knows with enough propaganda – the west will buy them, accusing with a bland PowerPoint presentation Iran of not adhering to the nuclear agreement and of running a secret nuclear program; he has allegedly ‘tons’ of documents to prove it. And he comes out with this absolute blatant falsehood 12 days before the deadline Trump set to decide whether or not to scrap the Iran Nuclear Deal. As the west, especially Europe and of course Master Trump, are all submissively on their knees in front of Israel’s guru, his message, repeated at nauseam since the 2015 deal was signed, may catch on — and this, despite Europe’s (commercially inspired) adamant wish to adhere to the 5+1 Accord. Iran is on her guard, and North Korea should be too. Peace in the Koreas – and in the future a unified Korea, unified families after more than 65 years; certainly, a dream for almost all Koreans. Yet, have the US motives to keep the DPRK under constant threat of war, under permanent fear, to keep the small country as an eastern entry point to Asia – to China and Russia – the same motive that started the war in 1950 – has that motive gone? What does that mean for Syria, Iraq, Iran and Venezuela? – Trump at one point within the last weeks has said that the US is going to withdraw her troops from Syria. Really? – Or is this a well-orchestrated, but little veiled game – to give people hope for peace and then let them drop back into the ruins? – Remember this little ‘schmoozer’ guy, Macron, went to Washington with one of his priority requests – Donald, please do not leave Syria, we need you there. Can you imagine – this little Rothschild implanted ‘call-me-president’ rascal has the nerve to say – we need you there? – Who in heaven does he think he is? – Let him militarize ‘his own’ (sic) country. France is already militarized and police patrolled like no other European nation – with the State of Emergency – effectively Martial Law – engraved in the French Constitution. Let the French people deal with Washington’s new baby poodle. France and the UK, of course along with Washington, are also following Israel’s cue – destroy and partition Syria and Iran – to create a Greater Israel, from the Euphrates to the Red Sea. And of course, the EU, miserable vassals of Washington, will keep their stranglehold with sanctions on Venezuela – Venezuela that has arguably together with Cuba, the best democratic system in the world, has never done any harm to anyone, let alone to those sanctioning countries. Even Switzerland had the audacity to join the EU’s sanction regime against Venezuela, a country that has been among the most pleasant partners of Switzerland in the past. One can only wonder, how low do these countries pull down their pants to please their ruthless Atlantists neofascist masters. Will this noble Korean peace spirit stretch through the world and bring about a higher consciousness, one that strives for peace instead of war? France is engaged in strikes, after strikes, after strikes against the Macron-imposed new labor reform laws that would literally strip French workers of most of the social and labor rights and benefits they have achieved since WWII – for what? – To make the rich richer, and the poor poorer. That’s what austerity is all about, has always been – the west calls it structural adjustment – what a euphemism! – And the people haven’t caught-on yet. Or is it the corrupt politicians that go along with it against the will of the people? 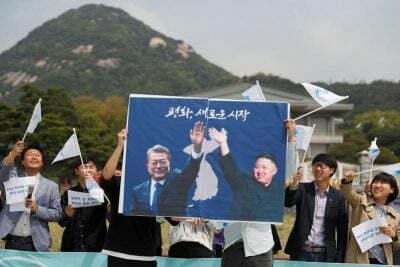 Peace in Korea – uniting again a historically peaceful and absolutely non-violent people – may be way more than a political act. It is a social compact of people; a vision to enshrine the non-violent nature of their culture upon Mother Earth, on a tiny fleck of earth in eastern Asia, on the Continent where the future lays – the East that brings human values back to the world, the OBI – One Belt Initiative of China, the broad economic and cultural cooperation enhanced by the SCO – Shanghai Cooperation Organization, led by China and Russia, and is already encompassing about half the world’s population, producing about a third of the globe’s economic output. – Could Korea be just that spark that ignites the engine to turning the massive ocean liner around, slowly but steadily – and, foremost – peacefully? Peter Koenig is an economist and geopolitical analyst. He worked for over 30 years with the World Bank around the globe as an economist in the fields of water and environment. He is the author of Implosion, an economic thriller, based on his professional Bank experience. He is a frequent contributor to Global Research.